Has it been over a year already? It only seems like yesterday when we were simultaneously being blown away by the features and performance of the, then new, nForce 680i SLI chipset, while still facing a mountain of problems as reference Designed by Nvidia boards just kept dying on us. This last year we've had a true love-hate relationship with the chipset – while it's provided some of the best features available and is the only thing really worth considering if you're investing in SLI, the whole experience has been marred by the fact our first boards killed graphics cards and during the last 12 months, some very iffy reliability from all partners. We've heard numerous tales from partners and systems integrators at different times during the year that any profit from selling the very popular nForce 680i SLI boards has been used up solely on RMAs. We're also back to "Reference Designs" now too. 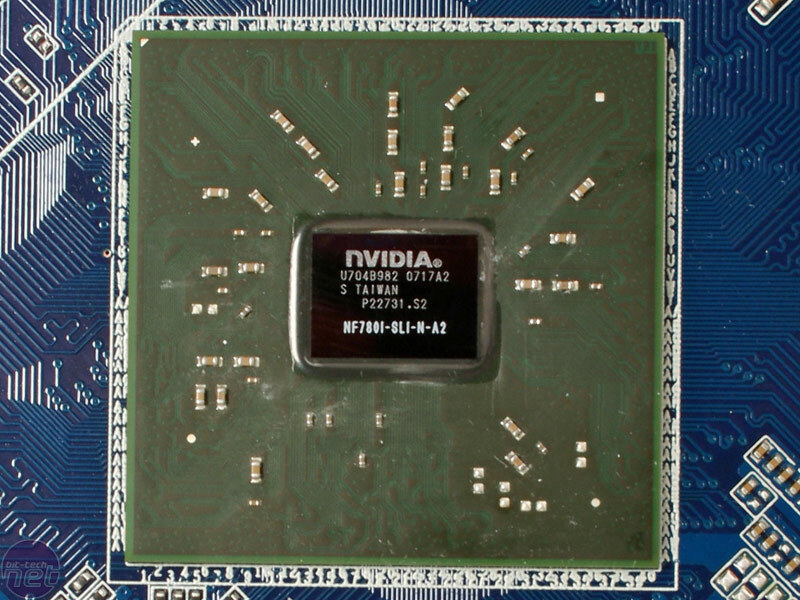 The initial decision by Nvidia before the nForce 680i SLI launched was to try to get all its partners to use the "Designed by Nvidia (don't call them reference)" boards, which didn't go down well with a few of its partners who actually have the engineering manpower to use a chipset with their own designs. However, these partners informed us that the pricing structure was set in such a way that meant that buying the premium chipset on its own was exceptionally expensive, and thus pushed the price of motherboards up into the stratosphere with the Abit IN9 32X MAX and Asus Striker Extreme as two great examples. Thankfully, Nvidia saw its mistake and has dropped this practice, which should provide far more competition and variation around the same £175 (inc. VAT) price bracket this time around. However, Nvidia is also back to "don't call it reference-reference designs" for partners who prefer to just rebrand. That's not a bad thing though – plenty of people bought the Nvidia designed nForce 680i SLI, so this recognition should follow over onto nForce 780i SLI. 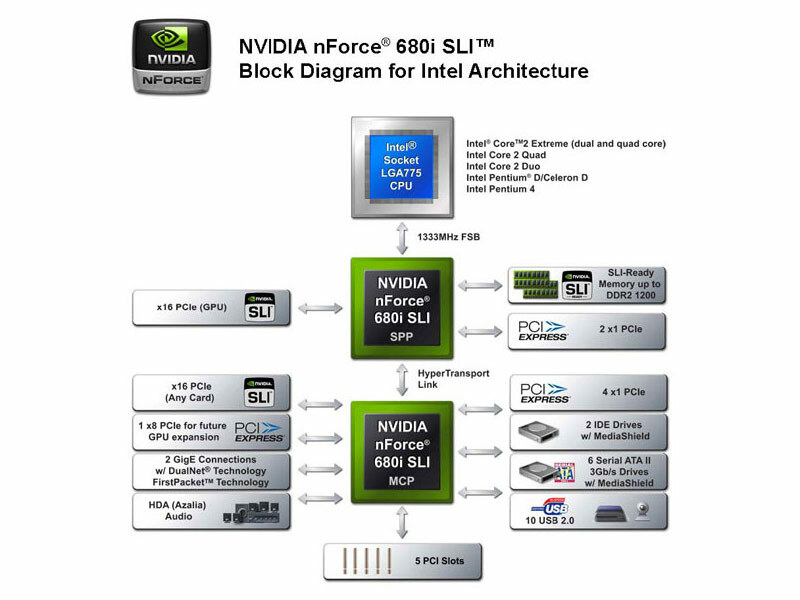 I’d also like to remind people of was the soft-pushed product that was the nForce 680i LT SLI. At the time it looked like a very positive price-to-feature comparison but very few were made available. 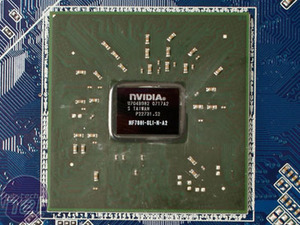 This was probably because Asus nuked it with its hybrid P5N32-E SLI Plus, which recognised that the nForce 680i SLI southbridge and cheaper 650i north bridge could be strung together on the same HyperTransport bus all Nvidia's chipsets use, providing more features than the LT offered, at the same price. 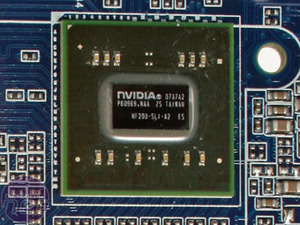 Much more recently, Nvidia has found that its 6-series motherboards won't support Intel's next generation 45nm CPUs. This is undoubtedly a massive kick in the nuts to anyone who bought a motherboard in the last six months with the intention of upgrading. It's different if you bought a launch motherboard in 2006 or early 2007 – as enthusiasts we should likely expect an upgrade every 12 months, and if we're lucky, 18 months. As it is, Intel is changing socket when Nehalem launches in another 12 months time anyway. 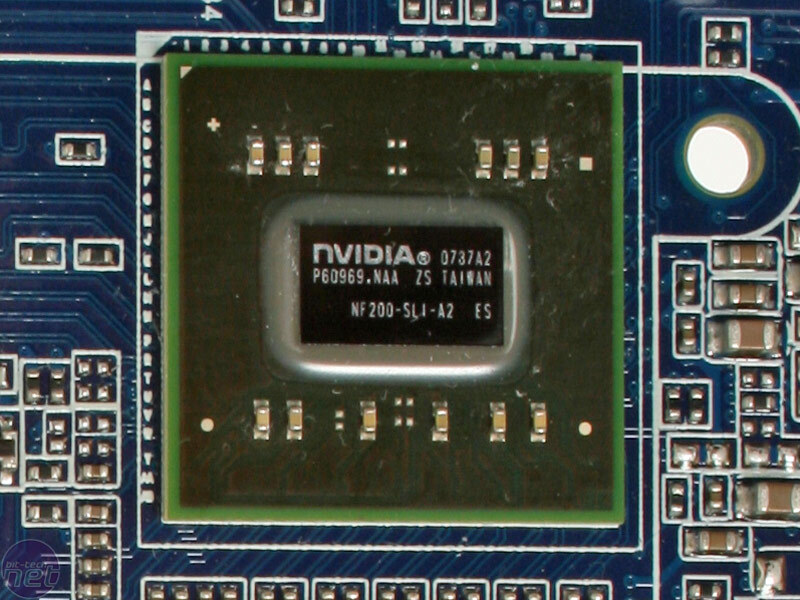 First off, we have the two chipsets under the north bridge heatsink on every board – they are the "new" nForce 780i SLI SPP and the NF200 PCI-Express 2.0 switch chip (pictured above). The two are connected via a 4.5GB/sec interlink, although Nvidia remained tight lipped as to what type of connection is actually used when we asked (we suspect HyperTransport). The north bridge A2 silicon is stamped with the 780i SLI name tag and actually reads quite differently to its nForce 680i SLI sibling. Just like with the nForce 680i SLI there is support for DDR2 533/667/800MHz with SLI-Ready memory up to 1,200MHz and the chipset supports a total of 8GB of memory. 99 percent of us will only be concerned with good old twin card SLI, as opposed to 3-way SLI, and the main PCI-Express x16 graphics slots are now upgraded to PCI-Express 2.0 and are also both piped into the north bridge. This should provide for a slightly better, latency balanced solution instead of having one slot from the south bridge and one from the north bridge, like with nForce 680i SLI. The third x16 slot is actually full x16 this time around but is only PCI-Express Gen-1.1. 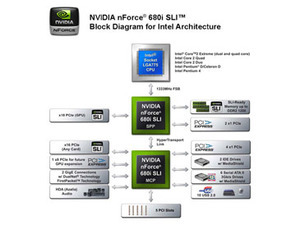 While this offers an unbalanced bandwidth and latency difference (because it's connected to the south bridge) at best for 3-way SLI, Nvidia doesn't seem too concerned about this because most of the data in 3-way is passed over the new 3-way SLI connector. When asked, Nvidia also said that PCI-Express 2.0 is just an incremental update and provides only a one or two percent performance difference at best. Most users that do require the third x16 link will only need it for more mundane things like hardware RAID controllers etc, and for that job, it's perfectly suited. 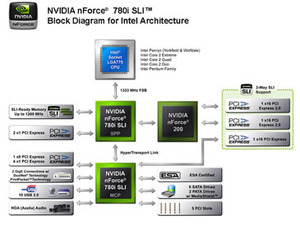 What the nForce 780i SLI does do is continue to support legacy Intel P4 CPUs on socket LGA775. While the backward compatibility is certainly favourable to some, it's also offering a strange mix - why spend all this money on the latest cutting edge enthusiast motherboard and resort to dropping in an abysmally performing Pentium 4 CPU into it? This also means that no particular optimisation has been made for current Core 2 CPUs with its vastly changed architecture either. What is slightly worrying is that on the XFX box there's only a mention of support for 1,333MHz front side bus CPUs. What about 1,600MHz FSB like the QX9770 that Intel released to the press not so long ago? We asked Nvidia and the only comment we have on it at the current time is that it's working on a BIOS fix. Every nForce 680i SLI we've used in the last year has overclocked in excess of 1,600MHz FSB so it shouldn't be that much of a problem for Nvidia. The official line is: "The nForce 780i SLI is designed to support shipping 1,333FSB CPUs from Intel... Nvidia will have a complete line up of products with support for 1,600FSB CPUs when they become available in the channel sometime next year."